Young children have 20 teeth by about the age of four. These teeth are all deciduous (they fall out). But that doesn’t mean that are not important. The habits that are created from the very beginning will set your child up for a life time of good oral hygiene. Your child’s baby teeth will start to appear, often with the central bottom teeth first, anywhere between 4 months and 10 months. However, like all developmental milestones there are always children who will ‘early’ and those that will be ‘late’. What is important is the way you care for the teeth and gums. Our dentists able to answer any questions about tooth eruption and care. As adults we have no memory of our own teething, so it can sometimes be hard to know what it feels like. While we will never know exactly what each child feels it is safe to say it is a painful and confusing time for your baby. As the parent it can be distressing to see you child in pain. We prescribe a lot of hugs and love. Together with chilled but not frozen teething rings or washcloths or a dummy. Please resist the temptation to put honey on anything the baby is sucking as that can cause problems for the teeth that are coming through. Brushing is a cornerstone of dental hygiene. As dentists we rely on our patients to maintain a good brushing routine between dental visits. This process starts as soon as a baby has a tooth. There are two main reasons for this. The first is the creation of good dental health practices as a normal part of personal care. The second is for the same reason we as adults brush, to remove plaque and bacteria. There is no difference between an adult tooth and an infant tooth in the fight against plaque and bacteria. For those first teeth it is advisable to use a soft cloth twice a day. As soon as the teeth appear, you can switch to using a soft children’s brush, with no toothpaste until 18 months of age, while your child lies on your lap or on a bed. We can show you some techniques to use. Many parents ask why babies need to see the dentist. 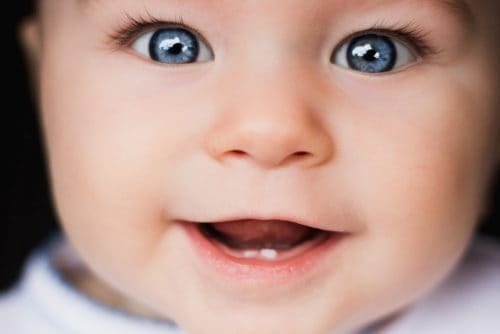 Most babies will have the majority of their 20 infant teeth by the time they are one and a half. There are two main reasons that we suggest a visit to the dentist. The first is to check that there isn’t anything that requires treatment. The second, which is perhaps more critical, is to start the routine and familiarity with dental visits. This visit can be incorporated into a parent’s visit. During this visit we can answer any concerns you have about brushing, teething or any other factors that affect teeth and teeth development.